Music is a vehicle for worshiping the triune God--Father, Son and Holy Spirit. 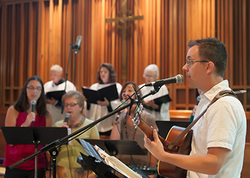 At St. Luke's we have a blended worship style, with a blend of traditional and contemporary music at our second service. Find below all of the musical opportunities available to you at St. Luke's. St. Luke’s Church is a member of the Royal School of Church Music in America. Four choirs of the Music Ministry welcome children from 4 years of age through high school. Their purpose is to lead music in worship, to develop music and worship skills in choristers and ringers, to nurture a love of singing the music of the church, and to encourage the development of faith in Jesus Christ. Click Here for the Children and Youth Choirs page. The Sunday Music Team is made up of singers and instrumentalists who together lead worship music for the the 10am blended Sunday worship service. Sunday worship music includes contemporary praise, traditional hymns, and liturgical pieces. For information on the Sunday Music Team, contact Nina Rodman at ninarodman@stlukeshhi.org, or Jordan Sturm at jordansturm@stlukeshhi.org. 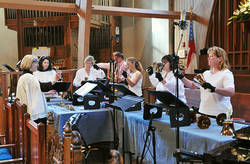 Ringing handbells is a real team sport! Music reading is necessary but not previous ringing experience. Ring in worship monthly, at Christmas, Easter, and special services. Two choirs of the Music Ministry enable adults to contribute musically to our worship. Men and women join together to rehearse and present special sacred music at Christmas, Easter, and for a large choral work. New singers are invited to join the choir for any of these presentations during the year! Come, join the St. Luke's Choir as it comes together again to prepare beautiful Christmas choral anthems (SATB) to celebrate Christ's birth at the magical midnight Christmas Eve service, concluding in the stillness of early Christmas morning.